A Tonk's Tail... err, Tale...: Happy Birthday Maxwell! Happy #3, you big handsome guy! From mom: You're my sweet boy, thoughtful and kindhearted. We're so happy we adopted you November of 2010. 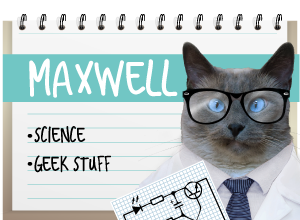 In honor of Maxwell's birthday, we're holding a commentathon. For every unique visitor comment, we'll be donating 50 cents toward the fundraiser that benefits six local shelters and a spay/neuter clinic here in Kanass City as we seek to make our town completely No-Kill. And be sure to check back later today for party pics - and Maxwell's birthday cake! Thank you so much to Savannah for making this lovely birthday card for our boy! Enjoy, play, have fun, nom and nap! Wishing you many more years of love, fun, and cattitude! 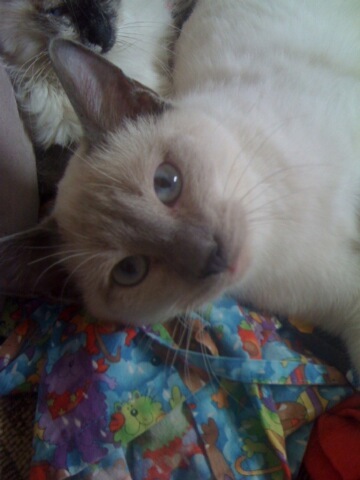 Lots of purrs from everyone at la casa de Texas! 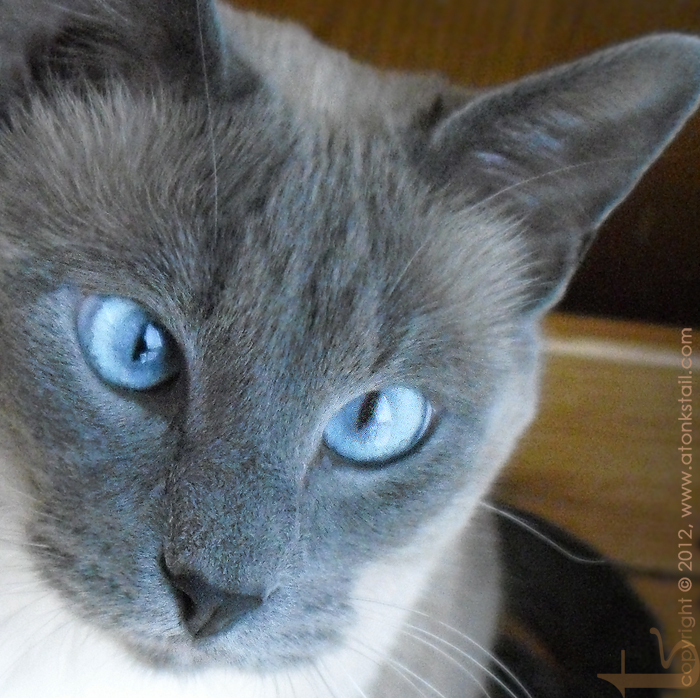 Happy Birthday, gorgeous blue-eyed mancat! Happy Birthday, Maxwell! We hope we get an invite to your cat mitzvah in 10 years! Happy Birthday Maxwell. We hope it is a fun one with lots of treats. Happy Birthday, Maxwell! How exciting that you're holding a commentathon to celebrate. We love you, buddy, and wish you many, many more happy days and years ahead. HUGS! And by the way, you can journey not only via your tunnel but by Ess AND cube. A tent too. Come on over after the celebration. Happy Birthday Maxwell and thanks for stopping by for Marg! Happy birthday, Maxwell. May you have a blessed day! Happy Birthday, Maxwell! We will be back, of course, to check out your birthday party cake and pictures! HAPPY BIRTHDAY , Maxwell ! A very Happy Birthday to you Maxwell. We sure hope you have a great day. That video is great too. Take care. 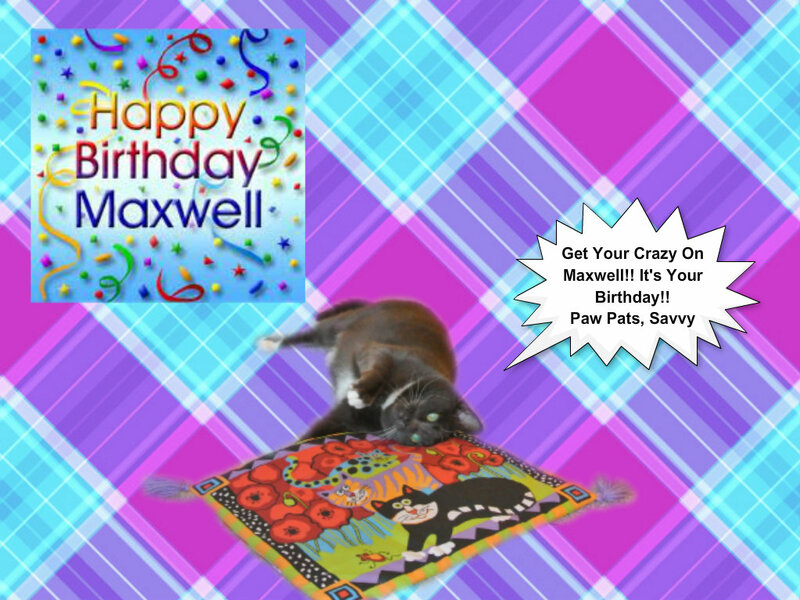 Happy, Happy Birthday Maxwell and we hope you have a wonderful day full of the best noms and a squillion treats. A very Happy Birthday to you Maxwell!! I hear four is a great year!!! Happy birthday, Maxwell! I hope you are getting lots of treats and toys today! BTW, my human thought the kid in the video was adorable! Happy Birthday, Maxwell! We can't wait to see your cake! Happy birthday you handsome fella! Happy Birthday Maxwell!! We hope you had a super duper day!!! 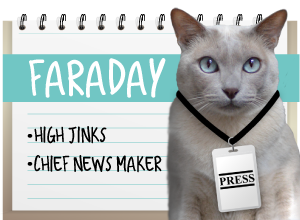 Oh, human you're way behind with that Cat Mitzvah party! Maxwell technically "came of age" about 2-1/2 years ago! He's been very patient waiting for you to figure it out! We won't tell him, though--we'll just fish him Hippo Birdie. He's so handsome! 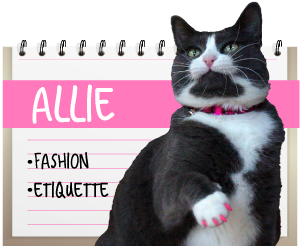 All of the BEST kitties are born in April! Meowza!! Happy Birthday handsome boy! Happy Birthday, Maxwell! We hope you're having a great day!! Awww happy birthday sweet Maxwell!